The West Briton's Redruth office received a tip off from a local resident and several 'eyewitnesses' phoned Radio Cornwall, declaring it was definitely a penguin; they had seen it. At one stage during the afternoon, hopes were high that the bird was Toga, a three-month-old penguin that disappeared from Amazon World on the Isle of Wight in December. But as the number of press photographers, reporters and well-wishers arriving at Portreath grew, so the doubts about the authenticity of the 'penguin' also began to increase. Eventually, two local men struggled out across the rocks to where the bird was sitting and identified it is a guillemot. One man declared it a bit of a wild goose chase. "More of a wild guillemot chase," declared a freelance photographer, who until then had been salivating over a potential exclusive and lucrative snap of Toga. Apparently, a huge shoal of sand eels arrived in the harbour earlier in the day, accompanied by seagulls and seals. It appears that the Guillermot was also attracted by the chance of a free lunch. Portreath harbour will be a major beneficiary of a £42 million programme of waterfront improvements, if a bid to the Big Lottery's Regional Living Landmarks fund is successful. Cornwall County Council, acting on behalf of the Cornish Harbours project, has applied for £25 million towards the cost of the five-year project, which would also see major regeneration work at Newlyn, Falmouth, Newquay and Looe. The aim is to bring disused or run down harbours and neighbouring waterfront locations back into use for the benefit of their communities. Georgina McLaren, from Cornwall Enterprise, which would administer the project, said: "Cornwall remains one of Europe's most deprived areas, and while much of the rural coastline is in the stewardship of the National Trust, many coastal communities are still struggling to find ways to adjust to the social, economic and environmental challenges they face." All five locations chosen for the project have been assessed over several years and, although different in character, share common goals. In all cases their aims include the promotion of community access, active enjoyment, learning, and local enterprise. The harbours would be the focus for regeneration actions and high quality physical improvements. Just two months ago Kerrier Council announced it wished to dispose of Portreath harbour and expressed a desire to see it pass into community hands. Portreath's inclusion in the Cornish Harbours bid would appear to be perfectly timed and to provide the resources to make it happen. As a result, the news has been greeted with delight by community groups in the village. Chris Watts, chairman of the parish council, said: "The parish council, the harbour association and Portreath Improvements Committee are working together on this project and we are delighted to be included in the bid. It's a really strong bid, with a good chance of success, and we're extremely optimistic about the outcome." If successful, the Cornish Harbours project would run from 2007-12. Portreath harbour would be regenerated and brought in to community ownership; the Edwardian pier at Falmouth would be refurbished and a new marine college built; East Looe would get a new promenade on its sea front; Newquay would get a new events area and seafront pathway; and there would be a new multi-use fish market building at Newlyn. Mevagissey, Porthleven and Hayle have been put on standby for the scheme, although the latter is expected to be the subject of a separate bid led by its private sector owners and supported by Penwith District Council. There is a consultation day about the future of the harbour at Portreath in the Millennium Hall on January 28 from 11am to 4pm. A Portreath man has spent nine days of his own time witnessing the relief effort in one of the world's remotest areas. Ken Wilkins, of Green Lane, who is a police inspector based at St Ives, travelled to the mountainous Kashmir region of Pakistan, witnessing first hand the scale of devastation caused by October's huge earthquake and assisting in the massive relief effort. Mr Wilkins is also a member of the Rotary Club whose renowned Shelterbox initiative, instigated by Helston Rotary Club, has become a focus for scores of local fund raisers. At a cost of nearly £500 each, every Shelterbox is packed and dispatched from their warehouse at the Water-ma-Trout industrial estate. Carried inside are a tent and sleeping bags for ten people, a shovel and tools, cooking aids, water purification equipment and other basic survival tools, even pencils and books for children. The difference they make is all too apparent from the positive feedback that has been received. As well as the massive donations and very hard work of those involved in the operation at Helston, including many volunteers who turn up regularly to help with packing, another contributory factor is the work of the Rotary Club's 4R teams (standing for Rotary, Reconnaissance, Review and Recover) which fly out to disaster zones with the boxes to ensure the aid is deployed to those who need it most. Mr Wilkins is a member of a 4R team. During his stay in the country he assisted in the distribution of sufficient Shelterboxes and additional tents to provide shelter to approximately 10,000 people. Overall the Shelterbox operation in Pakistan provided tents and the equipment listed to approximately 90,000 people. Now back in Cornwall, he said: "This part of Pakistan is a remote but beautiful area and looking out over a valley all that was left of the vast majority of homes were the roofs as the walls had just collapsed. "Some areas were totally devastated; we were shown one area which had seen a massive landslide in which an estimated 1,800 bodies were buried in the rubble. "Each day our brief was to distribute boxes to those we had allocated them to the day before, and then go with a Kashmiri guide .... to visit more villages." Rotary had a logistics team working at Islamabad airport getting the gear out to both other teams and this was essential as there was an incredible amount of red tape to overcome. But there were also unorthodox means of getting aid to where it was needed: "It wasn't unusual to see men in their 60s arrive wearing just sandals, and then put the Shelterbox on their back, with a strap around their forehead tied to both sides of the box, before walking back several miles across the mountains to their families." Mr Wilkins first became involved in the project after speaking with a colleague in the police who is also a 4R team member and he then helped pack boxes at the warehouse near Helston. He was then offered the opportunity to train to be a member of the 4R team. Just a week after completing an induction weekend he was offered a deployment to Pakistan replacing another team member who had to come back to the UK. "Being a member of the 4R team is a great opportunity to see that the equipment fund-raisers work so hard to pay for, ends up going to the right people," said Ken. "Having done some packing I must admit that it was a pretty good moment seeing a string of green boxes going down the mountain on people's backs or hung between poles." Following his trip Inspector Wilkins would like very much to give talks and presentations to any groups interested in hearing more about Shelterbox. Ken added that groups can be any size or age, including children. Insp Wilkins can be contacted on 01736 792733. To make a donation, volunteer or for more information on Shelterbox visit www.shelterbox.org or telephone 01326 569782. Since the last issue of the Parish Tram there has been some progress with regard to the harbour. The parish council's regeneration team has been working closely with Kerrier District Council to work out the details of the feasibility study. The first step is to hold a public consultation day similar to the event the parish council held for the village enhancement scheme. Hopefully the results will demonstrate to KDC and potential funders the village is backing the Parish Council and the Harbour Association's efforts to commission the feasibility study. The process of obtaining funding for the study continues, at present there are contributions from the Parish council, Kerrier district Council and Portreath Improvements Committee. Applications for further funding from various other sources including the National Lottery fund are ongoing. There have been offers from developers to assist, at present the Regeneration Team believes the project should stay independent so an unbiased study can be achieved. A harbour charitable trust management committee will soon have to be formed. This committee will be the driving force behind the feasibility study and the harbour improvements should the study have a positive outcome. The members will most likely be drawn from the Parish Council, Portreath Improvements Committee and the Harbour Association plus other interested groups or individuals. There will be forms to register interest available at the consultation day. The consultation day is to be held on Saturday January 28th between 11:00am and 4:00pm at the Millennium Hall, a good turn out and your support is essential to gauge the opinion of residents. The harbour project could change the village significantly in a number of areas, employment and tourism could increase, more business opportunities could become available and the harbour could become a very busy area both on and off the water. Your local councillors need to know what the opinion of residents is so they can act for the majority. Inside this issue is an advert for the event with a very short questionnaire. Should you be unable to attend on the day please fill out the form and drop it into the Post Office or if you prefer write to the parish council. While giving out Christmas trees for the PIC in the harbour car park I met a very sprightly elderly gentleman who after we introduced each other turned out to be Captain Gordon Greenslade, the last Cornish captain to bring a coal coaster into Portreath harbour. We had an interesting chat and I later went to harbour house where we were able to talk at length about his Merchant career. Gordon is 92 years of age, was born in Portreath and went to school here and then finished his education at Illogan Boys School. At the age of fourteen and a half he went to work in the harbour. His first boat was the Treliegh. He worked his way through the Bains fleet until April 1939 when he was made Captain of the SS Isleman. In his own words this is his account of the war years. "At the start of the 2nd World War, I was Master of a Coasting Vessel, the SS Islesman, trading out of Portreath Cornwall, to Newport Cardiff and Barry in the Bristol Channel, for steam coal for the mines, and cement, to Preston and Garston, and to Whitehaven and Maryport for house coal. To Charlestown and Par for China clay. In the first winter of the war, in December, one of our ships, the SS Ruban, hit the rocks off the Lizard in fog and sank - all crew saved. Later in the war, the SS Florence Reynolds, on voyage to Newport, was in collision with one of our destroyers and sank all crew were saved. We used to fly a Barrage Balloon at 1,000 feet from the masthead against low flying aircraft and had three Naval Gunners and a 40mm gun mounted on the stern. We used to go in convoy part of the way, sometimes enemy aircraft attacked us. There were moored mines, acoustic and magnetic mines and submarines about. Later on another of our ships left Maryport for Portreath, she was lost with all hands – we don't know what happened to her – she was the SS Kyle Rona. The SS Rosemore left Hayle for the Bristol Channel and was bombed and sank off Newquay, most of her crew were lost. Another ship from Hayle, the Porthgarret, went ashore at the Nash Bank in a gale and Black out. We in the SS Isleman were bombed off Bardsey Island- it was a near miss. We came safely through the war – the only Portreath ship left." Sandra Beckett on behalf of Captain Gordon Greenslade submitted the above to the People's War web site. Captain Greenslade stayed with the Isleman until October 1946; he had a daughter of two at the time and wished to spend more time with his family so took a job with a firm in Redruth working with automotive coachwork. Gordon is presently spending Christmas and the New Year at Harbour house retirement home. Portreath Badminton club has been meeting every Tuesday night since October 2004 in the Millennium Hall and it has been great fun. We have about 16 members now, of varying abilities from regular players to complete beginners. The annual membership fee is a mere £15, which gives you insurance through the Badminton Association and each session is £2 per person. It is possible to attend as a guest before you have to join, so come and try it out. At the moment, we are only playing on Tuesdays, but it is possible to book the Hall at other times according to availability. We have received a generous grant from the P.I.C. this has enabled us to buy a net and some shuttles so far. It is not just a chance to get fit, it is also a social occasion and a chance to meet new friends. As there is only one court, between badminton games, we play backgammon, charades, dominoes, juggle or just chat together. This venue is available to everyone, and the Hall can be used for a wide range of activities. Any individuals or groups interested in booking the Hall should contact the Bookings Secretary Mrs. Jan Sowden on 01209 842960. Hire costs are £25.00 a session (3 hours) for the large Hall and the smaller meetings room can be booked for £8.00 per session and these fees include the use of the fully equipped kitchen. 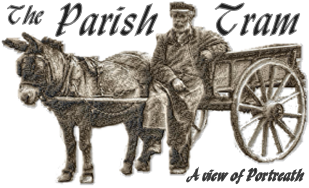 If you wish to run an event and would like to publicise the information in the next Parish Tram, please send your copy to the Editor. the mini/junior rugby section at Redruth rugby club aged 9.
he still plays his rugby with the Redruth club and also for Redruth school. Playing either center or fly-half. A dozen people went on the pre-Christmas shopping trip to Exeter on Saturday 26th November. Despite concerns over weather conditions, everyone had a good time and a smooth journey. There will be a Spring trip before Easter, any requests welcome. Can any of your readers help? I am trying to discover details of the last working ship to enter Portreath harbour, her name, tonnage, dates etc. Also does anyone know the date the port ceased to have its own harbour master and loss of its port status. The records should be somewhere but I've drawn a blank. I believe this to have been around 1967 or '68 just before the harbour houses were constructed. If anyone could help me I would be very grateful. Yes, it's January and that means the Portreath Improvements Committee elections are upon us once again. We need members that are prepared to attend the majority of meetings throughout 2006. These are held on the second Monday of each month. The main order of business at the meetings is to make decisions on the best use of the income created by the sea front car park, which is owned by the PIC. This is a substantial sum and the Constitution states that the income is to be spent for the good of Portreath village and it's residents. Consequently the agenda at the monthly meetings can be extremely varied, ranging from litter picking and property maintenance to long term financial investment and constitutional matters. Another responsibility is the day to day running and management of the sea front car park. This is carried out by the Portreath Association Ltd. (PAL), a small limited company that was formed because by law, a charity (the PIC) cannot trade to make a profit. Five people run the PAL, three of who are elected at the March meetings (they are elected from within the membership of the Portreath Improvements Committee) the other two members coming from the board of directors of the PAL. If you can't spare the time to put yourself up for membership, please still come along to the Portreath Institute on Monday the 23rd of January at 7:00pm for the election and vote for the residents you want to sit on the committee. There are 24 seats available and the rules of the PIC allow all village residents aged 18 or over to vote for up to 24 fellow residents. Voting slips will be passed around on the night. Currently the January meeting is the only time residents can attend the PIC meeting, so this is your chance to ask questions and put suggestions forward other than in writing, which you can do at any other time in the year. The Portreath Improvements Committee is a major influence within the village and needs your support. Please come along on the 23rd of January at 7.00 and vote for those you want to represent you for the coming year. Took place on Sunday 6th November, when we were exceptionally lucky to have a "window" from the bad weather, and yet another quality display. Thanks must go to Roger Bricknell and his team; also to PC Tim Roberts and the community Policing Team; the Gold Centre for the free use of their car park; 1st Buses for the park and ride shuttle. An especially big thank you to the Bonfire Building Team led by Trevor Tonkin, who all spent over three hours in bitter conditions that morning and to the stewards who collected donations during the evening and the Bar-B-Q team for cooking. Also the Promenade Cafe, the Retreat and the ShoreShop, who all stayed open throughout. 1. The Park and Ride scheme. 3. Insurance donation to Bicknells by the PIC. 4. Attendance by St Johns Ambulance by the Parish Council. This year the costs of numbers 1, 2 & 4 all increased substantially and without the continued support and community spirit of those mentioned, the event could not take place. Fortunately and increase the collection money was sufficient to cover the cost of the fireworks and ensure a display next year. Finally, thank you to those who contacted me afterwards by phone and letter; it was much appreciated. Alternate Greenhouse Club 12 plus youth group?